It's an interesting proposition. On one hand, it's a distinctive eye catching unit that will attract more than a few stares from beginners wanting something a little more futuristic. But at the same time, it's using touch technology that really hasn't caught on in the market. The scene has made it relatively clear that they prefer physical controls over touch ones, so I am surprised to see this unit at all. That said, the target market will probably enjoy the touch experience because of its cool rather than functional factor, leaving more experienced DJ to tamper with real buttons. Seems that the mantra of balanced outs seems to be hitting the right ears too. Nice to see them on such a unit. 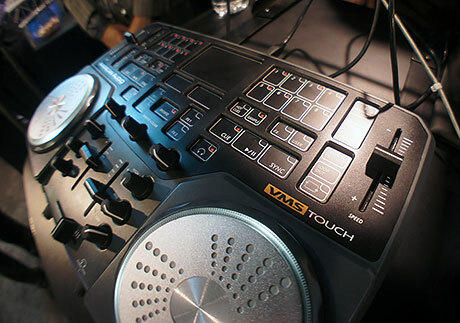 I think the part of this controller that sets it apart from other entries into the "touch" market is that it actually has knobs and faders, as well as a bunch of touch control. That's an important difference, as turning a knob is a lot more satisfying than pushing a touch control. This could be an interesting entry into the market for pushing touch control with a traditional DJ setup. The "Rep" looks like an insurance salesman. I know....'cause that's what I do. This product looks like its the companion to the DJ Hero turntable on Xbox. Those "touch" controls look to me like cheap plastic membrane switches (two thin layers of plastic with conductive surfaces that make contact when you push them). DJs want more control, not less. touch sensitive "screens" do not provide the feel/feedback that I want to have. Maybe I'm just old skool but c'mon, why should I have to look at the button I want to press to make sure it fired right?